Scientists have found one of the top three ways to improve memory is to perform novel or new activities. Do not be a creature of habit. Switch it up. The brain does not like if you are always doing the same thing. You must challenge your brain in different ways every single day. Patients will tell me they challenge their brains because they do crossword puzzles every day. However, that is not a novel activity because they are using the same parts of their brains and are thinking and problem solving the same way. Try a new game that you have never played before because it is an alternative activity that requires using a different part of the brain. Even the simple things in life should be done in a variety of ways. Patients are always telling me that they exercise which is very good for the brain. However, when I ask them about their exercise routine, many of them always exercise the same exact way. One patient says she jogs 5 miles a day on the same path every single day. Although it is fantastic that she is running every day, it would be better to jog one day, run one day, sprint one day, power walk one day, bike one day, swim one day, and rollerblade one day. Another patient said he goes to the gym and always runs on the treadmill on Monday, does weights for the upper body on Wednesday and weights for the lower body on Friday. Although I do commend him for working out 3 days a week, it is better to keep changing up the routine with weights, bands, or balls. He should use the bike, the stair master, the elliptical, the rowing machine, the free weights, the bars and other machines his gym possesses. Take different classes like cross fit, soul cycle, Pilates, HIIT, yoga, tai chi, Zumba, dance, pole dancing, circuit training, boot camp, P90X, and insanity. There are so many ways to use different muscles and perform different activities so the brain gets challenged in different ways. Other good novel activities that do not involve physical challenges are learning a different language, skill, or art. If you only speak English, learn a different language. Spanish is probably the best language to learn because so many people speak Spanish as their primary language in the United States. It has a similar alphabet and has some of the same word origins which would make it very easy to learn. However, if you really want to challenge your brain, it would be best to learn a language which utilizes an entire new way of thinking like Mandarin (one of the Chinese languages). First of all, they do not use letters, but they use symbols and they traditionally read up to down rather than left to right. Another idea is to learn Hebrew where you read from right to left rather than left to right. Hebrew has a totally different letter structure than many of the European languages. You can really challenge yourself in Hebrew because they even read it without vowels. 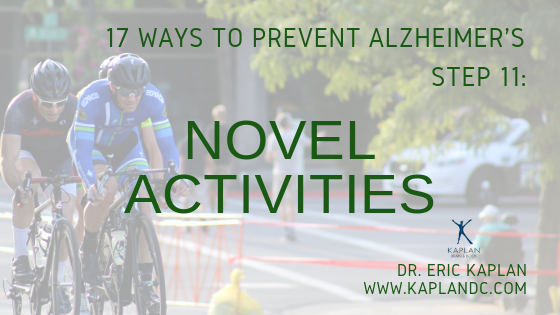 Because researchers are showing that novel activities are important for brain function, I also recommend joining book clubs, taking salsa lessons, learning an instrument, taking sewing lessons, or joining a cooking class. There are so many novel activities that you can perform on a daily basis. You can even start by taking a different route to work. Novelty can be applied to food, as well. Eat each color of the rainbow every day. Don’t keep eating the same meals everyday or every week. Don’t have a weekly menu. Change up the food you eat every day. If you would like the Kaplan Monthly Meal Plan for FREE please email me at info@kaplanbrainandbody.com and mention this post and we will send it right away. In conclusion it is important to change up every activity you do and keep learning new things. This will help you improve your memory, increase brain function, improve quality of life, and lead to living a long healthy life with your family and friends.